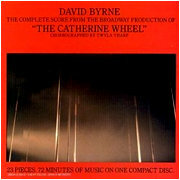 Commissioned by Twyla Tharpe for a Broadway Dance performance, this is a score with vocals, not a selection of songs. Smack in the middle of their collaboration with producer Brian Eno, his influence is heavily felt in the ambient walls of sound that slide seamlessly through the entire work. Peppered with steel drums as well as synthesizers, there’s a Brazilian undercurrent at play. All the members of The Talking Heads are here, but it’s David Byrne who got the title credit, not the band, and with reason. The arrangements are his. Eno filters it some, but the driving force is always Byrne, and this is the first of many projects that would eventually take him away from the band. The seventeen dances, accompanied by Byrnes twenty-three tracks chart the collapse of the Nuclear family against imagery of nuclear war. Having never been lucky enough to see the ballet and can’t hazard much of guess as to the pieces meaning per se, but for me there is a steady drift from tension and argument to joyous catharthis. A lot of where David Byrne was going as a solo artist can be heard here for the first time, from driving Latino beats to chunks that sound like they were sliced whole from the Byrne/Eno collaboration “My Life in the Bush of Ghosts”. Not surprisingly for a ballet, it’s the rhythm more than the sweep that carries you through, melding Caribbean steel with ambient industrial noise, catching you up and first matching and then speeding your pulse, and then at last spinning you free. This is one of those things that I should love and always replace when I lose it or it wears out from use. I never could get into it though. This seems interesting, I might give it a try. Tadao: When did you shifted from rabbits to cats? I HAVEN'T SO MUCH SHIFTED TO CATS AS i HAVE SHIFTED FROM BUNNERS. Another album I've never heard of. One of these days I'm going to have to pick all of these up.